Band performance times, onsite experiences, and the Friday Night Pre-Party have been revealed for Revolution Rock Festival—fueled by Monster Energy—set for Saturday, September 17 outdoors at Foxwoods Resort Casino in Mashantucket, CT. 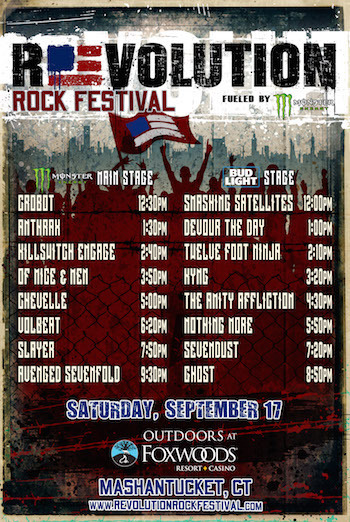 Produced by AEG Live, Revolution Rock Festival will feature a powerful rock lineup with: Avenged Sevenfold, Slayer, Volbeat, Chevelle, Of Mice & Men, Anthrax, Ghost, Killswitch Engage, Sevendust, and more. For those with Revolution Rock Festival Hotel Packages, the weekend kicks off with the Friday Night Pre-Party at the Grand Ballroom at Foxwoods Resort Casino, featuring performances from Thunderstruck and Strutter. Fans are encouraged to buy now and save. Tickets for Revolution Rock Festival increase to the following week-of-show prices starting Monday, September 12 at Noon EDT and remain the same through day of show. General Admission tickets will be $99.50 (plus fees) and 4-pack GA ticket packages will be $358.00 (plus fees). Hotel packages are SOLD OUT. Lobster Craft* — made to order, freshly buttered lobster rolls, from boat to bun! Sharethebus is the fun and easy way to get to Revolution Rock Festival. Sharethebus is offering same day transportation from Boston, Hartford, Providence, New Haven and New York City for a nominal fee. Get complete pricing and pick-up locations and times on the travel and transportation section of www.RevolutionRockFestival.com. Sharethebus was founded by two individuals from Montreal named Wolf and Kyle. They were fed up with how hard it is to rent a charter bus, and wanted a better way to travel together. In 2014 they started Sharethebus and quickly realized that what they're offering is something that a lot of people want. Today, Sharethebus is a growing team of travel experts, developers, and rock stars who are building the best way for you and all your friends to go where you want, when you want, all while having a blast. In addition to music, Revolution Rock Festival will offer multiple onsite experiences, including those listed below. Monster Energy will be keeping fans fueled up and READY TO ROCK by offering complimentary samples all day long at their Monster Energy Viewing Deck! Enjoy Monster Energy drinks from one of the best seats in the house! Make sure to follow Revolution's social media pages for Monster Energy's artist signing schedules! Revolution Rock Festival, where rock fans from all different backgrounds will be united by one thing: Bud Light. Look for Budweiser and Bud Light bars throughout Revolution Rock Festival. Don't wanna miss the big game? Your buds have you covered! We'll be showing a number of your favorite college football games at our bars all festival long! Customize your Revolution t-shirt at the Tailgate t-shirt shop! Tailgate Entertainment is a high quality merchandise company preserving memories for music, arts, and film festival fans around the country. Pick your own rockin' design or photo to have printed right on to your favorite piece of Revolution merchandise! Revolution merchandise will be sold throughout the festival and at the Tailgate t-shirt shop — don't leave Revolution empty handed. Visit the Dr.'s Shady Eye Saloon — a far cry from your average watering hole — and get a taste of the World Famous Dr. McGillicuddy's! Stop by the reverse barbershop and dress that bare face with a Dr. McGillicuddy mustache — then head to our jail cell for a photo op with your best buds! As the Dr. always said, "Drink to friends, good news, and any other reason." Every tattoo has a story, and Mario Barth, owner of King Ink Tattoo at the Foxwoods Resort Casino, has been helping rock fans tell their stories for over 30 years. Mario has won over 200 awards for his artistry including best tattoo artist of the year for eight years! Stop by the King Ink Tattoo booth at Revolution Rock Festival to meet some of our artists, browse some of their work, and even schedule an appointment for your very own piece of art.